See what happens when I knit other people's pattern's instead of working on my original designs? 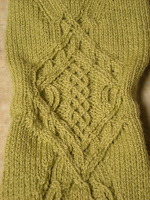 This is the front leg detail from Cookie A's "Stricken" sock pattern. I didn't have enough yarn to finish the toe, but a kind person from Ravelry sent me some. First, however, I need to rip and re-knit the foot due to a gauge anomaly. Again. However, I purled through the back loop too often and crossed too many twisted knits, and this happened. 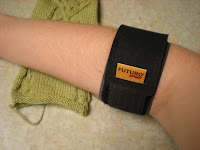 That's my tennis elbow support band. All right, no more twisted stitches for me for a while. Back to stockinette for the moment. It's been quite a summer. I've been working almost entirely on designing and have two sock designs in submission, one in preparation for self-publishing for sale, and a fourth on the needles to self-publish for free download (you know you want it!). Whew. All that design work doesn't make for much blogging, as you can see, since most publications want you to keep your projects under wraps until the release date. I went to Knitter's Connection and spent two days of class with my awesome friend Peg and the inspiring Cat Bordhi. She liked the design work I brought with me, which made me deliriously happy and kicked off my designing frenzy. You'll see that sock one of these days. I can't tell you where and when, but you'll see it. 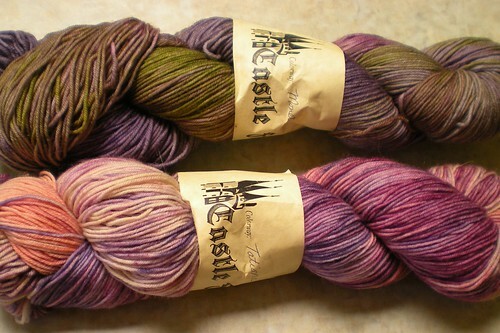 I was fairly restrained in shopping, but I did come home with yummy stuff from a new-to-me company, Castle Fibers. I wish I'd bought more. They have an etsy store but there's nothing like picking it out in person. Later I found out an amusing factoid: they are based in Rapid City, SD, which is the town where I was born. It took me two days of misery to get there, but I did eventually make it to Sock Summit in Portland. I had to rush straight from the airport to Amy Singer's "Making the Next Monkey" class, and still missed half of it, but Amy invited me to attend the first half of the other session to catch what I had missed (thanks Amy, you rock!). I'm feeling much better (or at least better-educated) about doing my own sock photo shoots for Knitty submissions now. I spent an incredible amount of time in the Sock Summit marketplace. (I swear it would have been cheaper if I'd gotten into more classes!) I met Casey and Mary-Heather in the marketplace, and did the fangirl routine (Yes, Casey,I'm the dork who gushed profusely about your beautiful programming). He gave me a Ravelry button! After embarrassing myself soundly, I didn't have the nerve to say hello to Cookie A. I didn't make it to Voodoo Doughnut (smelled the doughnuts, saw the line, kept walking) but I did have a root beer cupcake from Cupcake Jones. They have mocha almond fudge cupcakes today and I WANT ONE. Oh, uh, and I've been in the throes of moving to a different house. In my spare time. Riiiiight. I got my old house sufficiently (not entirely) emptied and fixed up to put on the market within SIX WEEKS of deciding to sell. It was a monumental, stress-inducing, sleep-depriving endeavor. Well, at least there's more room for yarn in the new place, even if there is an appalling lack of closet space.